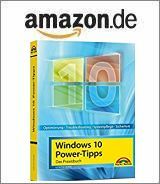 [German]Since April 30, 2018 Microsoft distributes the feature update for Windows 10 version 1803 (April Update). After the upgrade, some people will suddenly see OEM or recovery partitions that have a logical drive letter assigned to them. Then Windows 10 starts with constant notifications that the drive is full. Here are some explanations and a repair approach. I’ve just updated my laptop via Windows Update to 1803 – I suppose I could have waited, but I have working backups stored so I am not that fussed about installing the latest update. … Then I got a notification in the Action Centre of low disk space on Drive D: – which would be fine, but I don’t have a D: drive. So I looked in Explorer and sure enough I now have a 450MB D: drive with 45MB left. I looked in Disk Management and it looks like it’s the OEM or recovery partition. It never showed before, so can’t think why it would now. The following screenshot from tenforums.com shows the explorer view with the new logical drive D:. I received similare queries via Google+ (here is a photo of a chinese system). And at tenforums.com is another posting, describing the same thing and showing disk management entries. This issue isn’t that new, I found incidents reported in 2016. One theory is that an existing recovery partition is considered too small during setup and another partition is created. From Aomei there is this article, which deals with the question of additional recovery partitions. The workaround is to remove the logical drive letter from this partition. Then the partition no longer appears as a drive in Explorer, but is still present and can be used to restore Windows 10. The first idea many users have is to remove the drive letter from the disk management partition. If you want to use Disk Management to fix the issue and remove the drive letter from the partition, you will fail in most cases. The context menu does not support commands on this recovery partition. The above screenshot (source) shows that only Help is available as a command in the context menu. The partition must have OEM status. Depending on the variant, however, other partition identifiers may exist. But you can try and see if the way works after all. On my system, the Change drive letters and paths command is locked for managing drive letters for the recovery partition, however. Use a third-party partitioning tools, they do not have these limitations. But you can also use the tool diskpart to manage the drive letters of such partitions quite well. Here are the steps for a possible solution via the command prompt. 1. Open the command prompt windowwith administrator privileges (type cmd in the taskbar’s search box, right click on the cmd result shown, then click Run as administrator context menu command to open command prompt window). 2. In the administrative prompt window, run the commands listed below. Here I pulled out the relevant commands from the command prompt in a screenshot. The command list volume enlists the logical drives found with their numbers. Here a letter I is assigned to volume 0. Afterwards, the volume in question (here 0) can be selected and then the letter removed with remove letter. Then the logical drive is gone and the toast notification with the warning that the logical drive is almost full is omitted. where I: is the drive’s letter, while the option /D deleted the mount point. The whole thing are outlined here. Should I delete the OEM patitions? 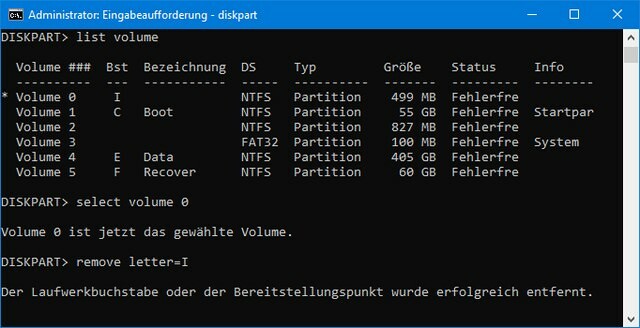 Use the commands above to call diskpart, select the partition and then delete the partition using the command delete partition. Then do a Windows 10 repair install via Inplace Upgrade (launch Windows setup from install disk within the running Windows). In the second step, Windows creates the required recovery partitions. However, I would like to issue a clear warning at this point: Deleting the wrong OEM partitions can result in loss of functionality (which the OEM has stored there) or a bricked system (if a modified boot loader of the OEM is removed). The comment below pointed me in the right direction (I newer observed this behavior on my test systems). The blog reader noticed, that the GPT partition type was wrong. Instead of 0x8000000000000001 (partition is required and no default drive lette), the value was set to 0x0000000000000001 (partition is required). So to avoid further hassle, use a third part partition tool or diskpart and change the partition type to 0x8000000000000001. Open an administrative command prompt (run cmd via Run as administrator) and launch diskpart. Try the following commands to set the nodefaultdriveletter attribute. as described here. Note: In most cases a third party partition tool should be more suitable. BTW: Microsoft documented the GPT_BASIC_DATA_ATTRIBUTES within this article. GPT_ATTRIBUTE_PLATFORM_REQUIRED: vaule 0x0000000000000001; If this attribute is set, the partition is required by a computer to function properly. GPT_BASIC_DATA_ATTRIBUTE_NO_DRIVE_LETTER: value 0x8000000000000000; If this attribute is set, the partition does not receive a drive letter by default when the disk is moved to another computer or when the disk is seen for the first time by a computer. Apparently the latter attribute was lost during (or before) the upgrade to Windows 10 version 1803. Consequently, the installer assigns a drive letter to the partition. This entry was posted in issue and tagged issue, partition, Windows 10 April Update. Bookmark the permalink. Just updated and now have a new partition and constant notifications that the drive is nearly full. COME ON microsoft! They need to fix this one quickly. What a joke. I am not too computer savvy so this is going to drive me crazy! Its starting to spread all over the internet so hopefully they will fix soon. Try my Fix #2 – it’s easy and should help. Thank you SO much! I was going crazy due to those stubborn 5-to-5 minutes notifications. Thanks, I used the diskpart tool as suggested and it works splendidly. Appreciated! Thank you for the fix. Thanks, just noticed this problem after the update. Silly problem. Thanks for the fix. Also affected by the problem. Fix #2 is a nice way to deal with it. See my ‘in deept explanation’ I’ve added above to fix your issue finally. Reading more about it, I noticed the attributes of the GPT partition were different (0x0000000000000001) from what they should be (0x8000000000000001); the partition should be marked as “hidden” at GPT level in order for Windows to NOT associate a letter to it. Thx for this hint – I’ve added an in deept explanation within the text above. Thanks guys. Good Work & you fuckers Rock. This has been bothering me for a long time and fix #2 was finally something that worked. Thank you for taking the time to post it. Thanks for the fix to this annoyance! There seems to be a flaw in the plan. Before applying either of the fixes described above using Windows’ own file explorer shows no such thing as an oem structure. Instead standard bin and sysinfo folders are shown. Could it be the wrong partition type mentioned is only hiding recovery data completely lost? My OEM partition was empty until I turned on to show hidden system-files. Then I got the folder you mentioned. Disk Manager also clearly states that the partition is OEM. those messages of disk space being low is very annoying, if you go to the notification center and right click on the disk low message you can hide all windows explorer warnings and that will go away. Id run the fix #2 as its easier for IT and the many calls this has brought forth. MS needs to actually test this crap out better before releasing. Fix #1 worked for me. I had a new 450mb F: partition after Win 10 update, 39mb free and constant popup about it running out of space. Disk Management only had ‘Help’ as a right click option. Thankyou. Sounds really good. I like Ubuntu a lot better but not a lot of Windows programs work with. I dream of the day that everything goes to Ubuntu semi-seamlessly (I can use Wine, but not a lot of things like to work with it) and keep all of my programs. I built my own PC and I still have this OEM partition. Possible reason for bug: The user in my company that got this error had a new disk installed recently with a complete re-install of windows 10 with a non-OEM ISO. So the patch had no existing OEM partition to rename so it creates a new one with the drive letter… that should not have a drive letter(?). I used the “fix # 2” and it worked! This has been bothering me since the last update of Windows10 on my laptop. First thing I thought about was that something went wrong with the HDD but fix #2 was finally the solution. Thank you for sharing this information. Thank you! Thank you! I’ve never used diskpart before, but your instructions were clear and simple enough for me to follow. OMG thank you. That was driving me crazy. The first suggestion worked for me very well. Super easy fix when I knew what I was looking for. Thanks, very clearly explained and works like a charm. Thank you! I used diskpart without error. What an annoying problem. I now have two partitions, about 500 mb each, that I would prefer to reintegrate back into my main volume…. but I digress. Thanks for the instruction! Really helpful! Fixed the problem. I already thought about removing OEM partition, until I saw your article. After update I manually removed letter for this #!~@$ partition every restart. Thank you for this. This worked wonderfully. Thank you, that was very helpful! Those annoying “disk full” notification is gone now. I used Fix#1 and I would like to mention that command “select volume” is missing a “=” sign. Thanks for the guide! Solution #2 worked a charm for me. Such an obscure issue, thanks! Many thanks. Diskpart successfully hid the drive. I will see if disk full prompt appears or not. “remove letter=I” won’t work – replace the equals sign with a space. Used fix #1, was simple and easy! The diskpart fix worked. Thanks a lot! I have 1803 and microsoft has still not made a fix. Nor can you use diskmgmt.msc.. Fix #1 was very easy for me to use. Thank you, thank you, thank you! This was really getting annoying. Thank you so much for this fix. Finally a help site that doesn’t send you to travel on your own into a digital catacomb when you barely have knowledge of how a computer even inputs keyboard strokes. Thanks you! Fix #1 worked perfectly! Thanks a lot. This was a pet peeve of mine. Thank you very much, the message about the full drive was becoming really annoying.